SAN FRANCISCO — The California Sustainable Winegrowing Alliance (CSWA) released its second annual CERTIFIED SUSTAINABLE Report, highlighting the achievement of the 143 wineries and 1,398 vineyards in California that are Certified California Sustainable Winegrowing (CERTIFIED SUSTAINABLE). In 2018, the third-party certification program continued double digit growth, with a 44% increase in the number of certified vineyards and a 13% increase in the number of certified wineries. View a list of current CERTIFIED SUSTAINABLE vineyards, wineries and wines HERE. The report shows that CERTIFIED SUSTAINABLE’s core tenet of continuous improvement was in full effect over the past year. Average scores improved for 60% of vineyard criteria and 71% of winery criteria in the California Code of Sustainable Winegrowing workbook of 200 best practices. California remains a global leader in sustainable winegrowing practices. Through participation in the California Sustainable Winegrowing Program, the state has one of the most widely adopted sustainable winegrowing programs in the world in terms of both winegrape acreage and case production. As of December 2018, 143 wineries producing over nearly 70% (209 million cases) of California's total wine production and 1,398 vineyards farming 149,922 acres (25% of statewide wine acreage) are CERTIFIED SUSTAINABLE. Another 15% of California vineyard acreage is certified to other sustainability programs in the state, including Fish Friendly Farming, Lodi Rules, Napa Green and Sustainability in Practice (SIP). These programs play an important role in the California wine community's efforts to produce high quality wine that is environmentally sound, socially equitable and economically feasible. 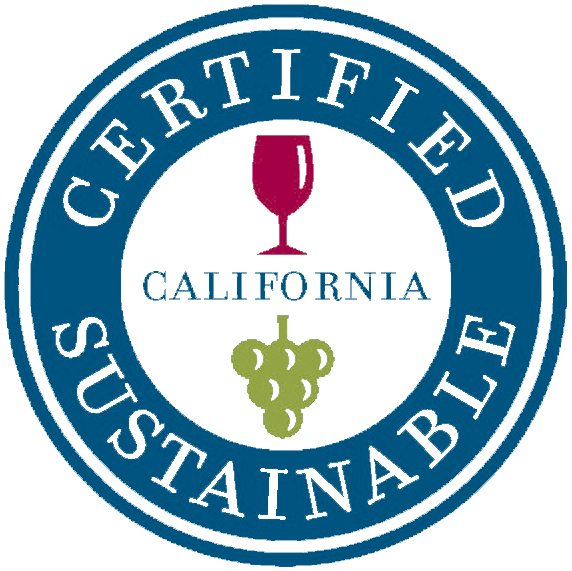 CSWA launched CERTIFIED SUSTAINABLE in 2010, creating a certification option for California growers and vintners that provides independent third-party verification of practices and other requirements. The certification program, developed and updated with extensive industry and stakeholder input, validates that stringent vineyard and winery requirements such as soil health, water and energy conservation, habitat preservation and other key sustainability areas are addressed. The program was updated in 2017 to allow use of a new logo on labels for wine made in certified wineries with 85% or more of grapes from certified vineyards (including CERTIFIED SUSTAINABLE, Lodi Rules and SIP) and 100% from California. Wines from the 2017 vintage are the first to display the logo, and 627,831 cases of wine from the 2017 and 2018 vintages are available or coming soon to the marketplace. View the CERTIFIED SUSTAINABLE Annual Report HERE. 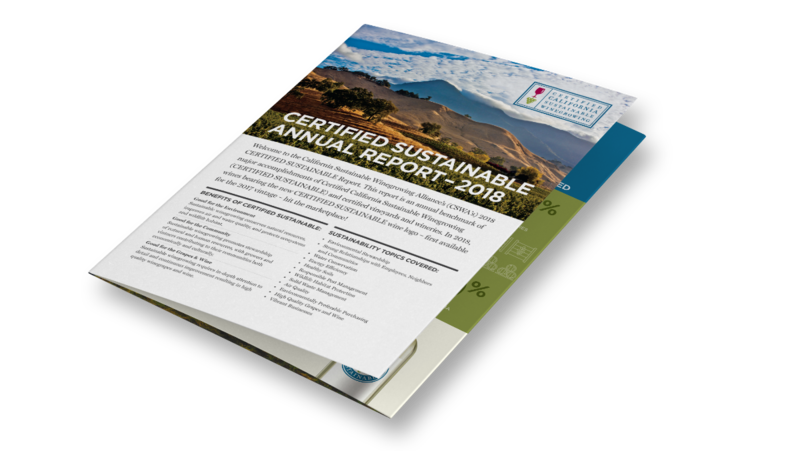 Find the companion appendix, which includes more comprehensive reporting of the adoption of sustainable practices by certified vineyards and wineries, HERE. To read more about sustainable winegrowing requirements for certification, visit the CSWA Certification page.